The last time I had a hot shower was the last day of the Bush Administra- tion. Okay, Obama had already been sworn in, but it was still nearly 3 months ago. And political commentators will be done discussing Obama’s first 100 days before I see another hot shower. But truth be told, I don’t mind the cold showers. 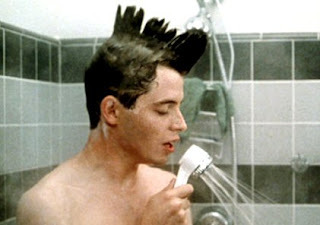 If we lost the technology for water heaters and the entire world could never take hot showers ever again, I’d be okay with it. Don’t get me wrong. I still have to will myself to step into the cold water. This challenge is made greater by the fact that I don’t have a fancy showerhead that can fan out to my entire person; water comes out of my showerhead in a single, steady stream that isn’t much different from how it might come out of a hose mounted to the wall. So taking a shower is a little like wading into a pool in the sense that you can’t quickly immerse yourself into the cold, you inevitably have to go in stages. In another sense, there’s no way to rip the band-aid off. Given the cold water, there are still 2 huge driving forces for stepping into the chilly stream. First, I get really dirty here. Between the humidity and the sweating, walking into town over dirt roads, and wearing flip-flops and shorts every day, on average I’m much dirtier than I was in my life in The States. Uncle Paul used to advocate that we all stop using soap because it kills off a lot of necessary bacteria. That just doesn’t fly here. Even if I spend the day lying on the couch, I am dirty, and a daily shower is the only way to stay remotely clean. The weird thing about cold showers is that in a so-hot-it’s-cool, Dante’s Inferno icy-ring-of-hell sort of way, the water actually feels searing in a way—like your nerves can’t process the extreme difference in temperature so it occasionally feels like the water is too hot before my body realizes the water is actually cold. In the village I took bucket showers, which involved dumping a bucket of water over my head after I’d lathered up with the soap. Perhaps it was the extra sense of control or the pleasantness of a shower after waking up from a sweaty night of sleep, but I really enjoyed the bucket shower. Occasionally in the village, the tap is out for long enough that people are forced to head to the public bathing pool to wash. People also use the pool to do laundry. I don’t think any of the Peace Corps in our group ever had to use the pool for bathing. That said, when I go back to the village, I often see all the females in a family heading to do laundry and bathe in the pool. Also in the village, when it would start pouring, we often saw parents command their children to strip and go shower. Kids would stand naked in the pouring rain, laughing hysterically. It was funny. As far as volunteer showering goes, I haven’t been to Supy’s house yet, but I hear that the spigot is too high for Supy to reach. Apparently the poor kid has to stand on a chair to turn on the shower. 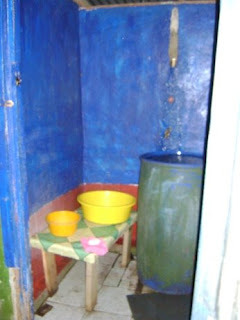 The moral of the story is that plumbing in Samoa isn’t always standardized. 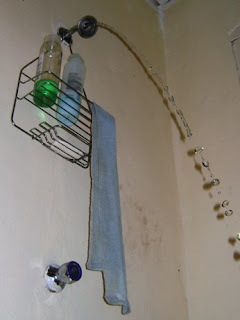 Finally, the one thing I learned about showering in the village is a loofa-type device is wholly necessary for washing. I loved the one my family provided in the village, and I bought myself one the first day I moved into my house. I once heard Blakey complain that the one her family provided was too rough. Mine is just short of a scouring pad, but I honestly feel it’s the strength I need to get the dirt off me. Tomorrow’s Cultural Exploration: Cell Phones. I hope you’re clean. Pictures below. My shower. One spout of cold water. Yes, Mom, I know that's technically not a loofa. I said it was loofa-like. Bucket shower in the village. Fill the big yellow bowl with water from the barrel. Then fill the little bucket with water from the big yellow bowl and pour it over your head. 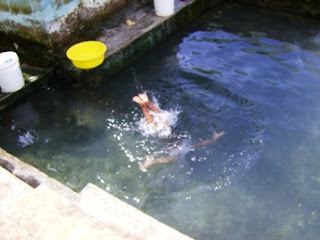 Akanese swimming in the pool where villagers sometimes bathe. Laundry buckets on the poolside. OMG! The barrel thing is something out of the early-90's for Samoa.